After a beer filled and raucous Saturday night (no we were not at Sanatacon but still managed to get a little crazy) we were all struggling on Sunday. I barely moved my poor body out to the couch for football watching and after the 1:00 games were over we all collectively decided to take a nap. Around 5:30 pm, the sun had gone down and I rolled back out of bed feeling better. It was my friend’s last night in the city and we had some more serious eating and drinking to accomplish. Luckily everyone was feeling much better after their own naps and just one hour later we were out the door and heading for my friends last request- pizza. I had planned for us to eat at Posto actually but there was a 30 minute wait when we arrived! I wasn’t in a waiting mood, that’s for sure, so instead we walked down to Motorino where only about half the tiny space was filled. 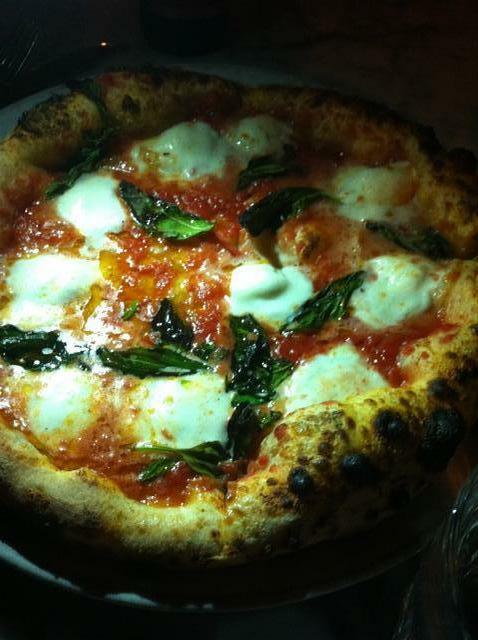 Our first pizza of the night was Motorino’s Margherita with tomato, mozzarella and basil. The first thing you’ll notice about this pizza is the dough. The middle of the pie is super thin while the crust is wonderfully charred and fluffy. Somehow this crust is both chewy and crisp, a feat not accomplished easily. The second thing you’ll notice about this pizza is the ingredients. Everything on this pizza is so incredibly fresh from the sweet San Marzano tomotoes to the creamy dollops of mozzarella and incredibly vibrant leaves of basil. This pizza is fantastic. My only small qualm was that the center of the pie was almost a little soupy. I think they rolled the dough a little too tight in the middle and it lost some of its normal flexibility. Our second pizza is another one of my favorites the Brussel Sprout and Pancetta with mozzarella, garlic and pecorino. Again the curst here is phenomenal but instead of fresh tomatoes its covered in nutty brussel sprout leaves, salty squares of pancetta and nice big chunks of garlic and drizzled olive oil. 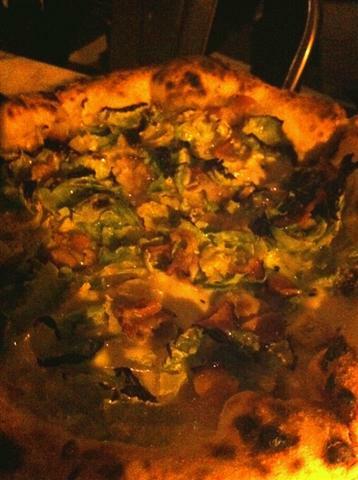 I wouldn’t say this is a healthy pizza but its nice to have some greens involved. I was trying to figure out which one I like more but they’re so different from each other its hard to chose. Luckily I always go to Motorino with a group, so hopefully I’ll never have to. Motorino definitely delivered in the pizza department although the service could improve. We had a long wait for both ordering and the check, which shouldn’t occur when the place is only half full. Luckily the food had made us feel better and we were finally going to enjoy Sunday night.